In North America there are over two thousand species; in Britain there are at least 430; while there are over 600 species in mainland Europe; over 200 in Australia; and even more the world over. Where they are found, the midges form at least 50% of the aquatic insect population. In rivers midge can outnumber the ‘mayflies’ by as many as four times. Since the early part of 20th Century entomologists have gained a detailed understanding of these insects; knowledge which anglers have not ignored. The midge’s lifecycle includes a full metamorphosis. Starting as eggs they hatch out as larvae and then have later phases as pupae and then adult. The larvae are very slim worm-like creatures with subtly segmented bodies. Their length varies from a few millimetres to at least two and a half centimetres. While a range of sizes may be found in stillwaters, rivers typically host the smaller species. Their colouration varies and shades of brown or green are common amongst the smaller species, but the larger varieties usually show deep haemoglobin red – commonly known as bloodworm. Depending on the species the larval phase will last between three months and two years. The larvae can be found at depths to over 50ft in lakes but predominate in marginal depths of 2-20ft. At the lake or riverbed, besides a few free swimming species, the larvae burrow or build tubes attached to weed, stones, and in the mud-water interface. Here they are secure, exposing themselves only to feed. Over-wintering populations sometimes migrate moving from shallow to deeper water and vice-versa according to the seasons. When the larvae forage or migrate they are especially vulnerable to predation by fish, and a well presented artificial can be effective for the angler. At the end of the larval phase the midge change into pupae. This transformation takes at most a few days and within the larval chamber. While the pupae may immediately swim to the water surface, water temperature may temporarily arrest this passage through the water column and the pupae will hold just off the bottom waiting for conditions to change. In lakes this phenomena, known as staging is especially significant to anglers, where large numbers can hold in the first few feet off the bottom. When conditions are right the pupae will start their slow ascent to the surface with a rise and fall motion assisted by gases forming within the pupal skin. During the ascendance to the surface the pupae will become more silvery as the gases build up; the pupae may also change colour. Either when staging or making their slow ascent the pupae are vulnerable to predation. The fish will often feed on them at a specific point in the water column so it can be critical to present your artificial at a specific depth to fall within the feeding zone. At the surface the pupae will hang down below the meniscus briefly between spells of swimming horizontally below it in search of a point to break through. When it is ready to hatch into an adult, the midge will lie static and prone below the meniscus and push its way from the pupal skin through the water surface, emerging from a split in the top of the pupal skin at the thorax. This process is not an instant one and certain conditions can trap the pupae in or below the water surface. When this happens fish may feed on them in a leisurely fashion picking them off one after another. On rivers the fish will hold a station and take the pupae as they drift into view while in lakes the fish will swim along picking the pupae off as they swim along a wind lane or another advantageous route. An intercepting cast should account for these fish. The hatched adult alights from the surface very quickly delaying only a few moments for their wings dry. The males then collect to form swarms while female adults fly off in search of cover or the male swarms. Swarming males release pheromes into the air which are detected by the females. Females fly into the swarm to mate. During mating sometimes pairs or groups of adults will fall on the water surface in amorous entanglements. Often mating activity will take place away from the water but later females will return to the water to lay eggs (oviposit). The females distinguishable by their stout conical shaped bodies can be seen carrying their eggs over the water. 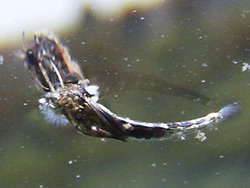 The ovipositing adult may in flight carry its abdomen curled down and forward presenting a hook shaped silouette. Presenting a suitable dry fly should account for fish found feeding on the mating and ovipositing midge. All year with larger insects typically hatching in warmer months. Emergences usually begin mid-morning, peak in the mid-afternoon and are waning by late afternoon. Where water is not frozen, small winter hatches often occur in more mild spells of weather. Fish may feed on pupae when no hatch is evident. Identification of individual species while technically possible is by and large an unnecesary effort. Distinguishing colour and size should be sufficient to guide your fly choice. Use Griffiths Gnat or Double Badger for dry flies, Shuttlecock Buzzer for an emerger and something like a Chromie or Ice Cream Cone for a pupa imitation. The larva can be imitated with a simple red flexifloss pattern. Employ standard dry fly tactics for the Griffiths Gnat, other dry patterns, and for emergers. Pupae patterns can be fished using several approaches including the static nymph, washing line, wind drift, upstream nymph and more. Read Brian Chan's detailed article on fishing chironomids. The Midge, Chapter 5, in Bugs of the Underworld. Thanks to Jindra Lacko who pointed out the short YouTube bug video added in comments [June 22 2012]. About how fast do chironomids push themselves to the surface? Do you mean the speed of moving through the water column or getting through the surface film? The speed of moving through the water, like how long would it take for a chironomid to get to the surface film in 30 feet of water? Given there are several variables including say, water temperature and species, the speed of ascent would be say 18 – 30 seconds per foot. If the pupa ascended to the surface in one motion, that would give you somewhere in the region of 15 minutes to ascend through 30ft of water. Of course the reality is, pupa frequently fall, as well as rise in the water, so that the full and ‘final’ ascent might, for instance, take 30 minutes. Warmer than average temperature and larger species, might result in a faster ascent. Here you can see footage of ascending midges in shallow water in warm summer months. You’ll see how fast they can move – maybe twice as fast as my average suggested above.